The many moving lights, haze, and smoke effects are amazing and might make members of the fire department the rare few who are unable to appreciate this unique production. Even if there were no pyrotechnics (and there are 50 elements in the chandelier alone), these guys would still have to be on hand, because Katie Travis as Christine is simply electric, setting off sparks with every aria. The love story of the music of the night, replete with angst, yearning, rejection and redemption is an emotionally gripping tale complemented with choreography and singing so superb that we were eager for intermission to finish and the production to resume. The poignant portrayal of the man behind the mask, brought to life by Derrick Davis, would be a winner for any date night. See The Phantom of The Opera and enjoy “The Music of The Night” at The Fox Theatre here in Atlanta – playing through March 5, 2017. Macaroni Kid Discount: Save AT LEAST 10% on most shows & up to 40% on service fees. Use code FRIENDS to purchase HERE. Disclaimer: I received complimentary tickets to this performance in exchange for this review. Opinions, however, are entirely my own. Go see it. Really. 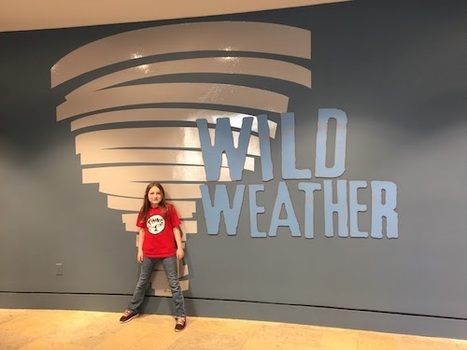 My 10-year old daughter and I recently had the opportunity to visit Fernbank Museum of Natural History to tour their new exhibit Wild Weather and view Fernbank’s first-ever 3D film Extreme Weather 3D. 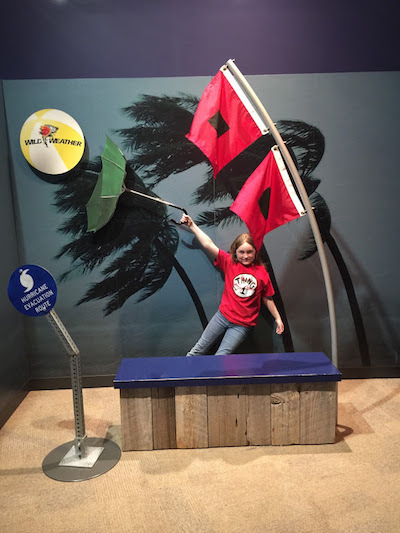 From hurricanes to snowstorms, and tornadoes to droughts, there’s so much to see in this exhibit, and the many hands-on learning opportunities for kids keep them actively involved. The snow section offers an igloo to climb through (not made of ice), as well as a kitchen area where we learned how to be prepared in case of emergencies. 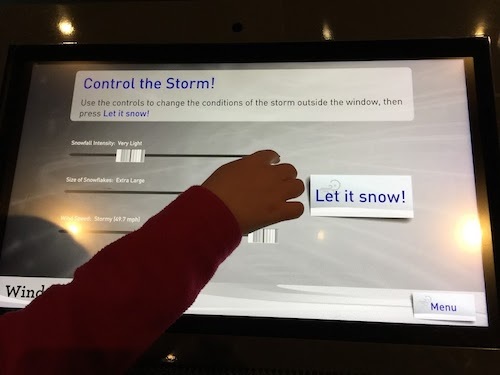 My daughter’s favorite part in this section was the virtual window, where she could control the snowfall intensity, size of snowflakes, and the wind speed. It was a blizzard outside by the time she was done! There was a display of actual photos from natural disasters here in the U.S., such as Hurricanes Ike and Katrina. My daughter was able to see just how much destruction weather phenomena can cause. From there, we moved on to the cockpit of an airplane where we could see the view from a Hurricane Hunter plane as it flies through a hurricane, or view what it’s like from the ground. In this sections there’s also a great spot for a photo op; we were totally blown away! 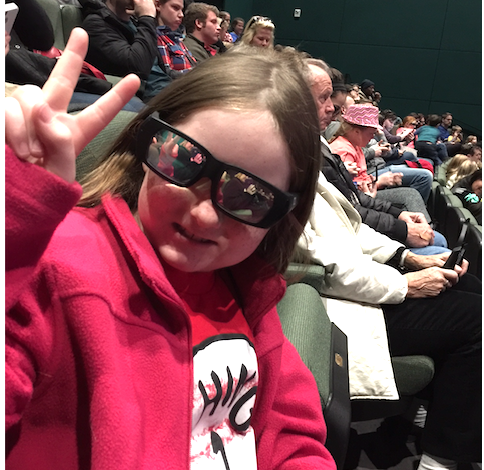 When we were finished in the exhibit, we headed to the new Giant Screen Theater to view Extreme Weather 3D. The theater re-launch kicks off the Museum’s 24th year in Atlanta, replacing the previous projection system with state-of-the-art digital laser projection with 3D capabilities – this theater is simply amazing! The ground-breaking laser-illuminated projection system was designed and installed by giant-screen industry leaders D3D Cinema, and engages moviegoers in the sights and sounds of science-based films unlike ever before. We donned our 3D glasses, sat in our comfy seats, and stared in awe at the truly giant screen. I felt like we were in the boat right next to an Alaskan glacier with the researchers. Ashes and embers from wildfires seemed close enough to reach out and grab. The movie itself was fascinating, covering tornadoes, Alaskan glaciers, and wildfires. When it was over, I asked my daughter to describe the movie in one word. Her response: “Awesome!” The exhibit and movie are a definite must see. See the Wild Weather exhibit at Fernbank Museum of Natural History, through May, 7, 2017. Extreme Weather 3D is playing through May 19 in the newly updated Giant Screen Theater. Looking for more fun things to do around Atlanta? Check out Macaroni Kid Smyrna Vinings Marietta and Macaroni Kid Buckhead Midtown Brookhaven! *The author received complimentary tickets to this exhibit in return for this write-up. All opinions, however, are entirely her own. Leggings, thick socks, and chill. It’s funny how things come back around, especially in fashion. I remember in late middle school, early high school when leggings, known then as “stirrup pants” were all the rage. I couldn’t wait to get my hands on a pair of black stirrup pants, so off to Maurices we went where black stirrup pants and a long dark green v-neck tunic sweater were procured. I threw on a white scoop neck shirt under the sweater and a long ankh necklace (probably from Contempo Casuals), and I was good to go. That was my favorite outfit. I even had a black Debbie Gibson-esque hat to go with it. Ah, the early-nineties. Gotta love it. These days when someone mentions leggings, the first name that comes to mind is Lularoe. This company seems to have single-handedly brought leggings back into vogue through their hundreds of consultants now pushing the product on Facebook. I can’t tell you how many LLR Facebook groups I’m currently in, because not all consultants carry the same selection. If you don’t have fast fingers when you see something you like, you’re out of luck. The purchase process is kind of annoying; you can’t just go to one website and buy what you want. You have to stalk at least eight different consultants to find what you’re looking for, then you have to “Claim” it, fill out a form, then wait for an invoice to pay. Annoying. You have options. I recently found a company called Legging Army offering leggings that are practically the same as the Lularoe version. Super soft, super comfy, the same fabric content, fun patterns AND solids (yes, black is currently available), always FREE shipping, and the best part: you can order from a website and they’ll show up at your door! No more stalking, no more waiting for an online “pop up shop” to see what the selection is. It really is a One Stop Legging Shop. Check out all they have to offer here. Now that I’ve found these awesome leggings, I’m offering a giveaway! See below for details..and good luck! It’s that time of year again! When you throw your week-old resolutions out the door and get ready for Girl Scout Cookies!! Or, do you go the opposite direction where you figure out how many of which cookies you’re going to order, then set up your workout plan accordingly? Me? I’m the first type. Or I would be, if I actually made any resolutions to begin with. But that’s another post! Here in our region, Girl Scouts are hitting the streets to take orders for their wonderfully delicious cookies. If you see one coming, get ready! These girls have goals, and using the line “I would order, but I don’t have any cash” doesn’t work anymore. Part of the Girl Scout motto is to “Be Prepared”, and they now have card readers on their phones. So get out your cards, and help support this amazing organization for young girls. Ask them what their goals are. Ask them what their troop will be doing with the money earned from their cookie sales. Our troop is saving money to go to Savannah, GA, which is the birthplace of Juliette Gordon Low, the founder of Girl Scouts. The Juliette Gordon Low House has a wonderful program specifically for troops, and our girls can’t wait to take part in that. The troop is also planning a sleep over at Zoo Atlanta at the end of this school year, so they’re a little excited about that, too. A few years ago, I went a little crazy with helping our troop get ready for their cookie sales, and created a few printables. I’ve also made these available for everyone, so feel free to download and use them! To download, just click on the picture, then right-click and select ‘Save As’. Print the cards full size and borderless (if you have that option) on card stock, then cut apart on the lines. Or, you can purchase the Avery Postcards 8387. Super simple! Terms: PERSONAL USE ONLY. Please do not sell the design or the finished product. Print as many times as you need. Design © Shannon Moore, 2014. …no no, not that one. But it IS coming right up! But, right now is the most popular Customer Special of the year for Thirty-One! Our best-selling Large Utility Tote is the Customer Special this month, AND you can also get the INSERT for the tote! The Stand Tall Insert is only available once a year, and they always sell out, so be sure to get yours! The Insert adds stability to the Large Utility Tote, and pockets, making the tote even better! Ready to order? Go to www.GetMoreBags.com and shop online. Or, call/text/email me for more details! Jumping back in with a few updates! 1. In my last post, I was absolutely gushing over The Happy Planner. I like it, it’s a nice planner, but I decided to go back to my Erin Condren Life Planner. Why? I’ll post about that later. 3. You may be asking, has the scope of your blog changed? Not really…you may see more posts about my business, but all in all, it’ll stay the same, at this point. I hope you keep reading! Have you met the NEW Create 365 Happy Planner from Me & My Big Ideas? If you’re a planner nut like me, you’re going to love it. When I first saw pictures of it surfacing on Instagram, I fell in love, and immediately wanted one. This response was very similar to what happened when I first met the Erin Condren Life Planner last year, but I think I was a little more excited about the Happy Planner, if that’s even possible. Part of the excitement was that I couldn’t even get my hands on it right away. This is BRAND NEW. The Happy Planner was released in April, I believe, but then there was the whole port embargo or something crazy on the west coast, so it wasn’t actually available to ship to stores until May. Luckily, Me & My Big Ideas (MAMBI) has their own online shop, and the planners were available there first. Was I one of the first to order on the very first day? No, but it was hard. I think I waited about 5 days before I took the plunge. I wasn’t sure about buying it, even though I wanted it; I already had an ECLP that’s good through December of this year. But when have I ever let something like that stop me? Yeah. Never. I couldn’t wait to get it, and it actually didn’t take long to ship, hurrah! I’ve been spoiled by Amazon, and now can’t stand to wait more than 2 days for anything I order to get to me. I didn’t do an unboxing video or anything crazy like that, but here are my first thoughts and reasons why I love this planner. It’s so pretty! Love the gold foil, even though I wasn’t sure about it. Ability to add pages/inserts (oh, the possibilities). Expandable – larger rings/discs can be purchased, which equals more pages! You can fold it over on itself, like a notebook. The discs have hearts in the center! The weekends in the weekly view are shaded, setting Saturday and Sunday apart from the rest of the week. As it should be. The monthly tabs aren’t laminated, BUT, the front and back covers actually lay over them, so that should help keep them from getting bendy. I may still get tab covers just to be on the safe side. No personalized covers unless I make them myself. Don’t think I won’t. You have to get a special hole punch in order to add your own pages and inserts. A standard 3-hole punch won’t work (at least not that I’ve discovered). Now, don’t get me wrong, I still love my Erin Condren, and will continue to use it. I haven’t actually used the Happy Planner yet, as it doesn’t start until July 2015, and I haven’t gotten the extension pack with customizable extra pages to go ahead and start using it now, but I will soon. Overall, I’m really happy with this planner and excited to use it. I’ll be doing a full-on comparison between the Erin Condren Life Planner and The Happy Planner in my next post, so stay tuned! Do you love the rice you get with your dish at your favorite Mexican restaurant? Are you looking for an easy way to recreate it at home? We have ‘Taco Tuesday’ nearly every week, and Mexican or Spanish Rice makes a great side dish. I was buying the packs of precooked 60-second Mexican Rice at the grocery store, but those packets are kind of expensive when you’re buying them week after week. And there’s no telling what kind of stuff is in there – hello, ingredients I can’t pronounce. So, I went on the hunt for an easy and tasty recipe that I could make at home. Specifically, I wanted something that I could just throw in my rice cooker and let it do all the work. I finally found a recipe that I modified a bit, and the family loves it! This is a regular in our house, and if we don’t have it with our tacos, enchiladas, and/or quesadillas, there is mutiny. I hope you enjoy it as much as we do! 1/2 to 1 cup cheese - depends on how cheesy you want your rice! Place all ingredients in your rice cooker, and stir gently. Select the "White Rice" setting. Check the rice after 30 minutes - my rice cooker doesn't need the entire cycle, or the rice will be over cooked. Do things look a little different around here? They should – the blog is moving to its very own server! So, please be patient as I’m getting things back to normal. Everything is still here; all downloads are still available, but if you have issues, please let me know! Be sure to visit again soon to check out the new look!